This link from Nomination's first themed collection is called 'Bambul'. 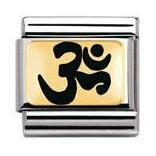 The symbol is made from Enamel on an 18ct Gold background, resting on a Stainless Steel Classic Nomination link. Mix and match with other pieces from the collection for an inspiring Flower Power look to put a smile on your face! Please quote reference number '030270-12' if you are calling to order, so that we can get the right link to you as quickly as possible.